It’s April Fool’s Day, so let’s have some fun :) Last year I announced fake news about C++: deprecation of Raw Pointers and two years ago I wanted to have C++18. So what’s coming this time? Answer the questions, and find two that makes no sense and don’t have any correct answer… can you solve such test? Updated! : the quiz is no longer accepting answers, see the key below. Two of the questions in the quiz below are “April Fool’s” and don’t make sense, and they don’t have the correct answer. In that case, you can click “that’s a joke!” answer. If you leave your email address, you’ll take a chance to win a coupon for C++ ebooks. Your email address will be only used for this quiz and nothing else; you won’t receive any extra message from me in the future. please mention the question as they are shuffled. The quiz lasts for the next 48h (till Wed 3rd April, 8 am PL Time), and I'll contact winners on Friday. If there are more people with the same point count qualifying for the prize, then I’ll draw the winners randomly. The Amazing Performance of C++17 Parallel Algorithms, is it Possible? What’s the false statement about std::variant? What’s the shortest declaration of a lambda in C++17? Which sentence is true about the below code? What’s the true statement about the following code? 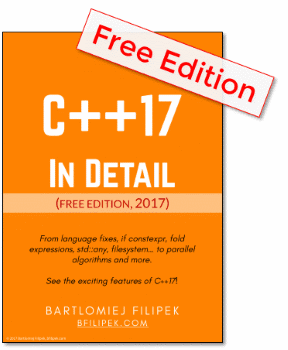 In C++17, What instructions are allowed in a constexpr function? Can you use std::optional<int *> ?